The Ferrari F355 was released in May of 1994 with the intentions of increasing both the performance and drivability of the 348 for which it replaced. The engine displacement was bumped to 3.5 liters and a new and radical 5-valve cylinder head were introduced, pushing horsepower to 375 and torque to 268 lb/ft at 6,0000 rpms. At first introduction, both a coupe and a Targa style GTS were available with the spyder version following in 1995. 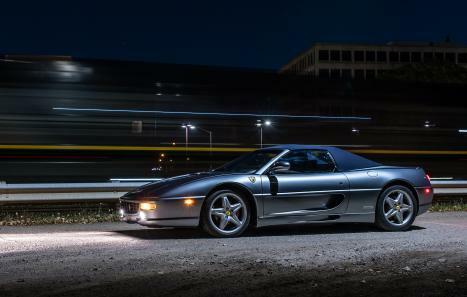 The F355 received great praise and sold very well through its 5 years of production. A total of 11,273 F355s were produced making it the most-produced Ferrari at the time, but was later surpassed by the 360 and later the F430. In early 1999 Ferrari decided to create a limited edition send-off model before ending production of the F355. They dubbed this model the “Serie Fiorano” and decided to limit production to just 100 units, all of which were the spider body style and all of which were designated for the U.S. market. Ultimately though, 104 would be produced in total with 3 examples going to Europe and 1 ending up in South Africa. The goal of the Serie Fiorano was to increase performance to be more in line with the Challenge version while still keeping many of the creature comforts of the standard models. To accomplish this increase in performance Competitzione-derived Fiorano suspension package was fitted which provided a wider track, stiffer springs, and thicker anti-roll bars. Drilled and ventilated discs were fitted and paired with competition brake pads as well as a Competitzione-sourced steering rack. To differential, the model further Ferrari added a number of styling cues which included a numbered dash plaque, Challenge grills, shields, Carbon-fibre bits throughout the interior and Suede-covered steering wheel. Out of the 100 cars destined for the U.S. Market, 74 were equipped with the F1 transmission and only 26 had a 6-speed manual.